Eloise Pitts O’More—well into her 90s—drove through historic Franklin, Tennessee, in her gold Cadillac, fire-red hair pinned in a topknot barely visible over the wheel. Mrs. O’More was a local legend, founding O’More College of Design in 1970 and personally overseeing nearly every aspect of its operation, from interviewing students for admission to teaching classes. The grande dame of design died in 2002, but the school continues to thrive, graduating hundreds of interior, fashion, and graphic designers. 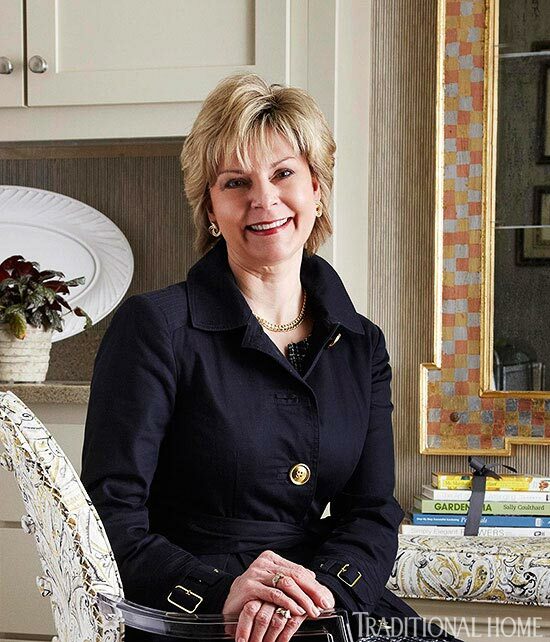 The college’s interior design department, Traditional Home magazine, Franklin-based Bristol Development, many local and national businesses, and 17 O’More alums—graduates from 1978 to 2008—united in 2013 to create a showhouse that would have made Mrs. O’More proud. Thanks to John Montgomery, president of the Franklin construction firm Carbine & Associates, and project managers Ray Kash and Doug Julian, the house was completed in a record time of just four months. Bench back fabric (“Don’t Fret”/Bittersweet #66182): Schumacher, 800/523-1200, fschumacher.com. Bench seat fabric (“Mini Zigzag”/Birch): Robert Allen, 800/333-3777, robertallendesign.com. Architectural engravings on wall (copperplate custom matted and framed architectural engravings, hand-painted with chalk paint; original prints by Batty Langley, England, c. 1700): Bennett Galleries, 615/297-3201, bennettgalleriesnashville.com. Tape trim on chairs (“Malmaison Tape”/Dove #66150): Schumacher, 800/523-1200, fschumacher.com. Drapery (linen): The Curtain Exchange of Nashville, 615/463-2727, thecurtainexchange.com. Spearheaded by designer JoAnne Haynes (class of 1981) and Bristol Development cofounder Ashlyn Hines Meneguzzi, the team built a 4,500-square-foot shingle-style cottage on an infill lot just a short walking distance from Mrs. O’More’s 1866 mansion (now used for college administration offices). 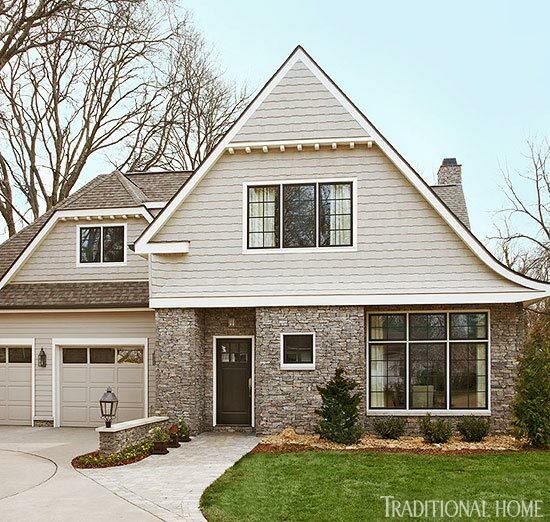 Architect: John Abernathy, DA/AD, 2520 White Ave., Nashville, TN 37204; 615/248-3223 x 401, daad-group.com. Builder: John Montgomeory, Carbine & Assoc., 615/661-9995, carbineandassociates.com. Stone on terrace and front walk: Belgard Hardscapes, 900 Ashwood Pkwy, Site 600, Atlanta, 30338; 877/235-4273, belgard.biz. Flooring throughout: Shaw Floors, P.O. Drawer 2128, 616 E. Walnut Ave., Dalton, GA 30722; 800/441-7429, shawfloors.com. 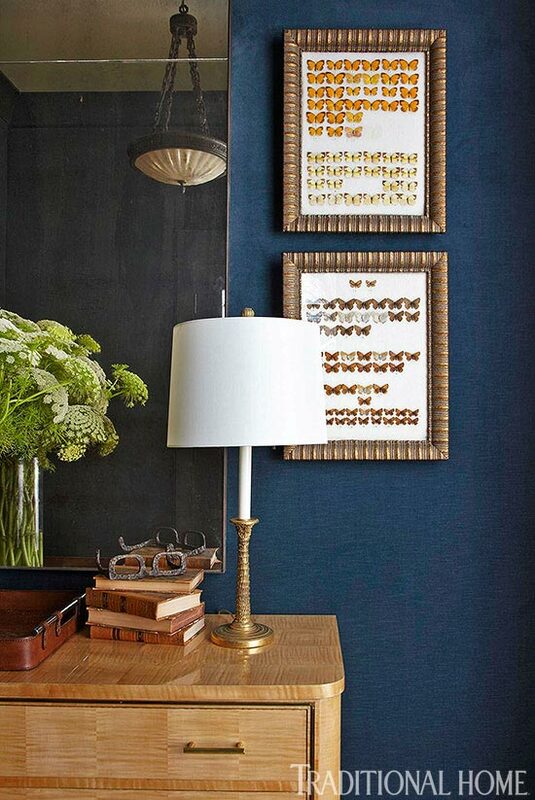 Roger Higgins and Ann Shipp (both class of 1993) set the pace, designing a foyer with walls luxuriously upholstered in peacock blue velvet (one of Mrs. O’More’s favorite colors). Interior design: Roger Higgins and Ann Shipp, R. Higgins Interiors, 2000 Blair Blvd., Nashville, TN 37212; 615/297-9632, rhigginsinteriors.com. Upholstery on walls (“Cannes”/Pavo, velvet): Latimer Alexander, 800/654-2313. Trim paint (“Amazon Green” #2136-30): Benjamin Moore & Co., 888/236-6667, benjaminmoore.com. Chest (vintage); ceiling light; table lamp; art; accessories; hide area rug; chair (antique); pillow (“Orange Sag Ikat”): R. Higgins Interiors, 615/297-9632, rhigginsinteriors.com. “We wanted the entry to feel like an embrace of color and texture, so that when you come through the front door you feel comforted,” Higgins says. Architect John Abernathy took inspiration from Southern shotgun houses, stacking rooms front to back, when designing for the long, narrow lot. 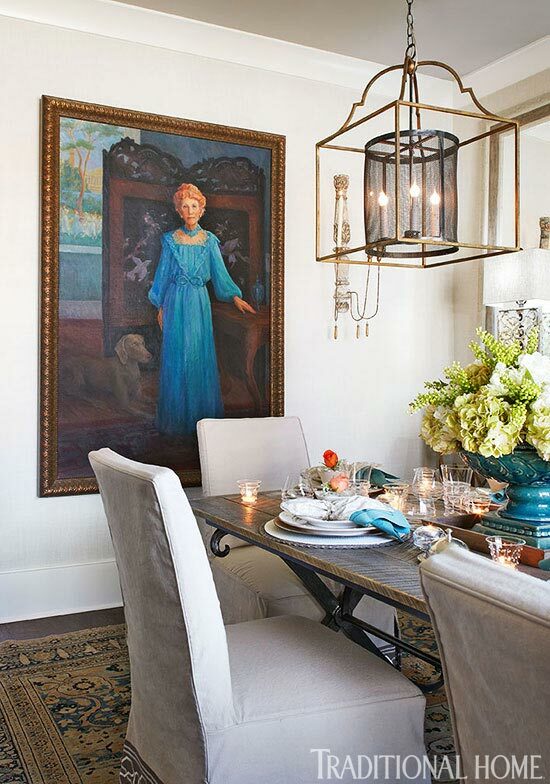 The arrangement puts the dining room at the front of the house, washed with northern light from an 8x8-foot street-facing window and overlooked by a portrait of Mrs. O’More in a teal blue (of course) gown. Designer Crysta Allsbrooks Parish (class of 2002) created a serene setting, drawing on the teals of Mrs. O’More’s dress and mixing rustic surfaces (reclaimed barn-wood table with iron base), subtle textures (grass cloth wall covering and antique Persian rug) with casual linen slipcovers. Interior design: Crysta Allsbrooks Parish, Dana Goodman Interiors, 6313 Chickering Woods Drive, Nashville, TN 37215; 615/373-8765, danagoodmaninteriors.com. Wallpaper (“Regatta Raffia”/Cream #T5711): Thibaut, 800/223-0704, thibautdesign.com. Ceiling paint (“Shale” #861); trim paint (“White Dove” #OC-17): Benjamin Moore & Co., 888/236-6667, benjaminmoore.com. Iron pendants (custom); dining table (custom reclaimed barn board on iron base): Dana Goodman Interiors, 615/373-8765, danagoodmaninteriors.com. Flooring (“Pebble Hill II 5-inch Epic Engineered Hickory”/Weathered Saddle): Shaw, 800/441-7429, shawfloors.com. Lamp; stone/iron console table; mirrors; sconces: fabricated from antique/reclaimed architectural elements by J.J. Ashley’s Antiques & Reproductions, 615/791-0011. Portrait (Mrs. Eloise O’More, founder of O’More College of Design): on loan from college. 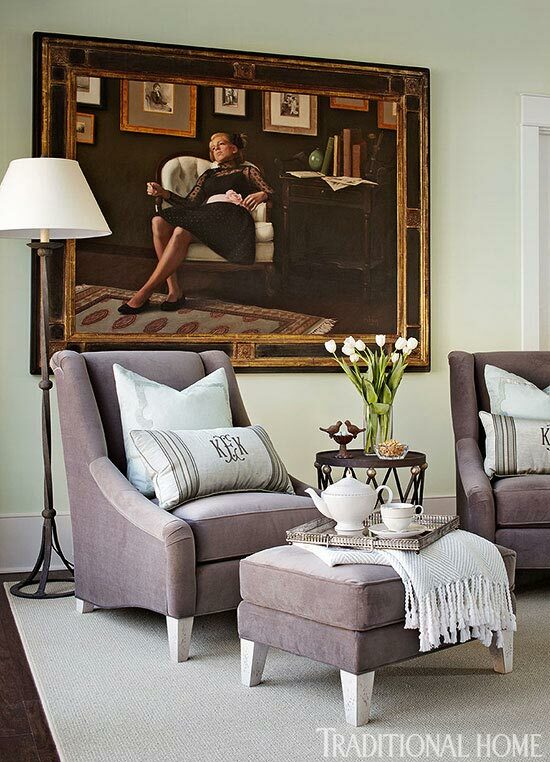 “My concept was to capture a formal atmosphere, while allowing for a sense of comfort,” says Parish. 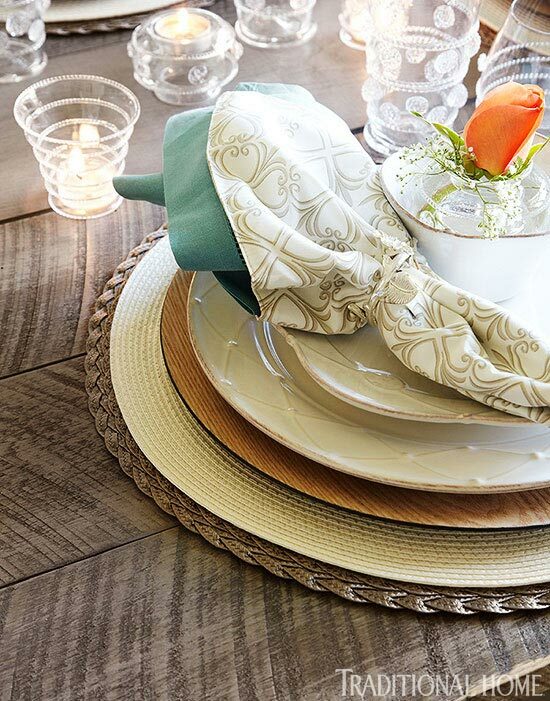 Juliska tableware; glassware and accessories: Color, 615/269-3071, colorathome.com. Dining room designer Crysta Allsbrooks Parish (standing) with designer Dana Goodman of Dana Goodman Interiors. See more of the kitchen on the following slide. Kitchen design: Vicki Edwards, Kitchen & Bath Images, LLC, 1710 Gen. George Patton Drive, Suite 110, Brentwood, TN 37017; 615/377-8771, kitchenbathimages.com. Wall paint (“Warm Stone” #SW-7032): Sherwin-Williams, 800/474-3794, sherwin-williams.com. 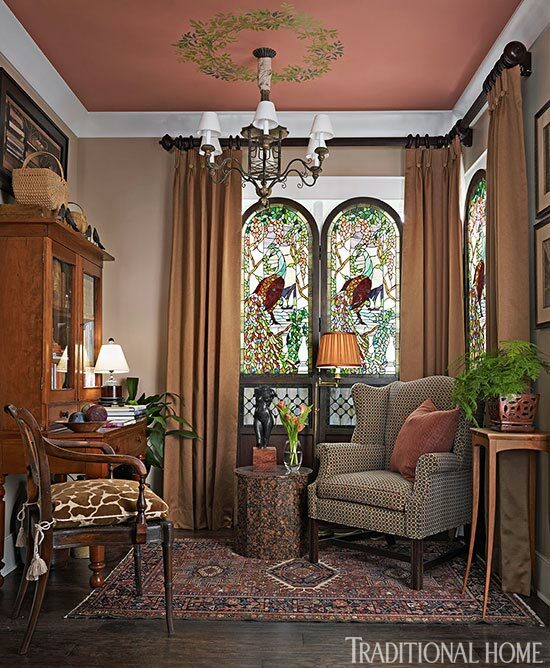 Ceiling and trim paint (“White Dove” #OC-17); island base paint (“Stone Brown” #2112-30): Benjamin Moore & Co., 888/236-6667, benjaminmoore.com. 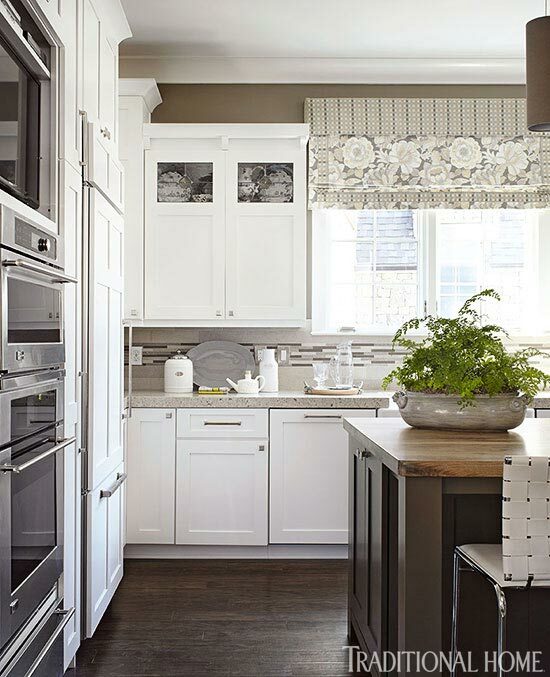 Cabinetry (in Nordic White, by Holiday Kitchens): through Kitchen & Bath Images, 615/377-8771, kitchenbathimages.com. Cabinetry hardware (“Sutton Place”): Atlas Homewares, 800/799-6755, atlashomewares.com. Countertops (“Darlington,” Cambrian Collection): Cambria, cambriausa.com. Island countertop (walnut in color, Driftwood): custom. Mosaic backsplash (“Slivers”/Chatham Blend); limestone backsplash (“Piana,” 3x12-inch field tile): Mission Stone & Tile, 615/244-6448, missionstonetile.com. Window-shade fabric (“Naive Floral”/Pewter); valance and edge trim on shade (“Grandma Mary”/Graphite): Robert Allen, 800/333-3777, robertallendesign.com. Cylinder pendant lights: Tech Lighting, 847/410-4400, techlighting.com. Counter stools (“Criss Cross Counter Chair” with faux leather straps #333061): Zuo, zuomod.com. Accessories: The Registry, 615/595-2323, theregistryfranklin.com. Sink (“Whitehaven”/Sea Salt): Kohler, 800/456-4537, kohler.com. Faucet (stainlesss steel pull down): Moen, 800/289-6636, moen.com. Range (36-inch 6-burner range); ice maker in island: GE Monogram, 800/626-2000, monogram.com. Range hood: Vent-a-Hood, 800/331-2492, ventahood.com. “The warm gray and brown tiles and the brownish-gray color of the island really dictated the color scheme,” Edwards adds. The island top is walnut in a driftwood finish that “almost looks pickled or bleached.” Perimeter quartz-surface countertops were finished with a hefty 2 1/4-inch-thick edge in keeping with the scale of the room. To create visual flow from room to room, hickory floors in “Weathered Saddle” from Shaw Floors were installed throughout the home. Wall ovens; refrigerator; dishwashers: GE Monogram, 800/626-2000, monogram.com. Interior design: L. Jonathan Savage, Savage Interior Design, 924 Ireland St., Nashville, TN 37208; 615/244-5674, ljonathansavage.com. Wall paint (“Acadia White” #AC-41); trim paint (“Black”): Benjamin Mooe & Co., 888/236-6667, benjaminmoore.com. Ceiling wall covering (“Trixie”/Black, Gold #HP-1003-E, by Albert Hadley): Hinson & Co., 914/881-1470. Dining table (“Black Beauty,” discontinued) Bunny Williams Home, 212/935-5930, bunnywilliams.com. Dining chairs (vintage, maple, Regency-style with cream leather seats); chandelier (vintage, refurbished): Savage Interior Design, 615/244-5674, ljonathansavage.com. Rug with leather binding (“Pieterdam,” wool): Fibreworks, 800/843-0063 x 2, fibreworks.com. Roman shade and credenza fabric (“Leather Stripe”/Jet #62513): Schumacher, 800/523-1200, fschumacher.com. Lamps on credenza (“Sprig’s Promise” #FTB534H1, by Frederick Cooper for Wildwood Lamps): Wildwood Lamps, 252/446-3266, wildwoodlamps.com. Framed paintings: Bob Christian Decorative Art, 912/234-6866, bobchristiandecorativeart.com. Footed bowl on credenza, with lemons (“Hartland”): Simon Pearce, 800/774-5277, simonpearce.com. Plates by Alberto Pinto add a touch of whimsy with their tropical bird patterns. 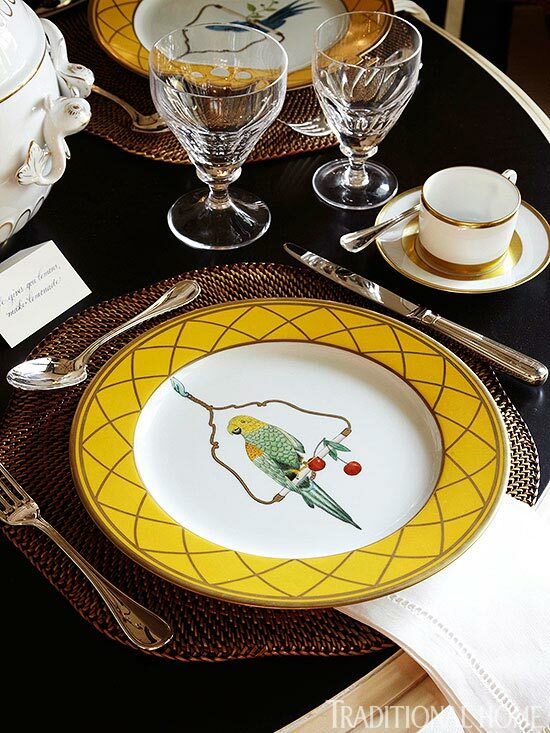 The yellow and gold details of the plates and china stand out brilliantly against the glossy black table. Bird plates (“Les Perroquets” buffet plates by Alberto Pinto); goblets (“Iona” by William Yeoward Crystal); cups and saucers (“William Gold,” by Robert Haviland & C. Parlon); scalloped placemat (by Deborah Rhodes); flatware (“Albi” by Christofle Sterling); centerpiece tureen (“Golden Edge Tureen and Platter,” by Herend): Corzine &Co., 615/385-0140, corzineco.com. Napkins (“White Hemstitch”): Dransfield & Ross, 212/741-7278, dransfieldandross.biz. 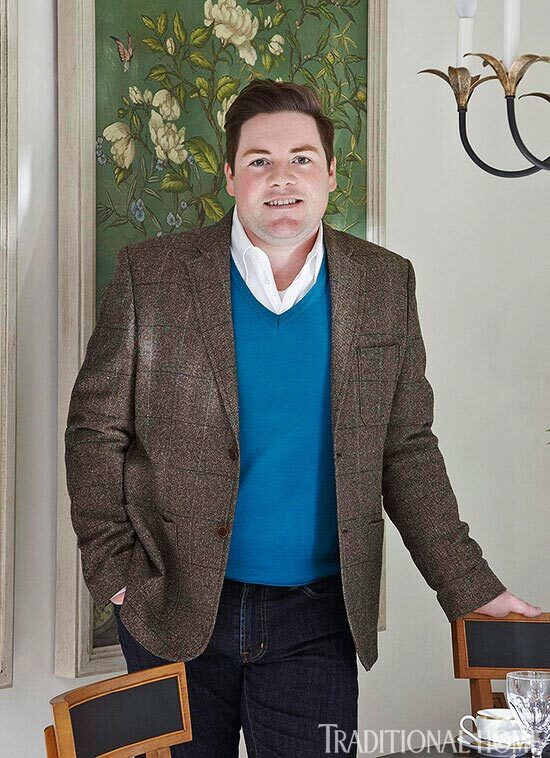 Breakfast room designer L. Jonathan Savage. Charm was the operative word as Jennifer Markanich (class of 2008) created a multifunctional mudroom, which serves as a back entry from the garage. A utility sink skirted with a yellow, cream, and gray paisley fabric carries the charm banner, but it’s super functional as well. A wide drainboard makes it a good work surface when loading laundry into the nearby washer and dryer. 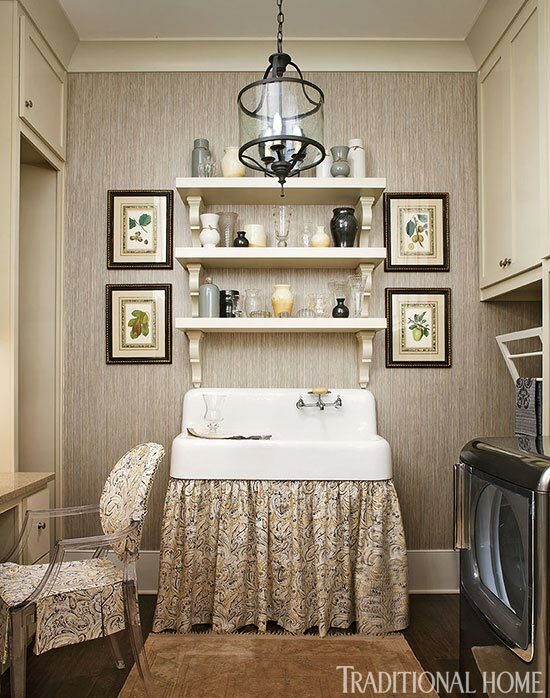 Shelves above the sink are stocked with vases, simplifying flower arranging. And for a fun twist on traditional, the designer covered a modern Philippe Starck “Ghost Chair” in paisley fabric. See more of the mudroom on the following slide. 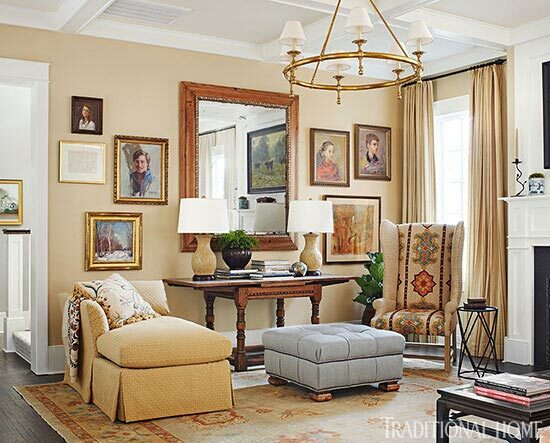 Interior design: Jennifer Markanich, Timeless Interiors, 4137 Brandywine Pointe Blvd., Old Hickory, TN 37138; 615/406-1986, timelessinteriorsdesign.com. Wall covering (“Zebra Grass”/Earl Grey): Phillip Jeffries, 973/575-5414, phillipjeffries.com. Ceiling and trim paint (“White Dove” #OC-17): Benjamin Moore & Co., 888/236-6667, benjaminmoore.com. Cabinets and shelves: Mid-South Custom Cabinets, 615/287-0380, msccabinets.com. Cabinet hardware: Top Knobs, 800/499-9095, topknobs.com. Countertops (“Hyde Park,” Classic Collection): Cambria, cambriausa.com. Sink (“Sanford Cast Iron Sink” with drain board): Signature Hardware, 866/855-2284, signaturehardware.com. Chair (“Philippe Starck Louis Ghost Chair”): Kartell, 888/405-4899, kartellstorela.com. Fabric on chair and sink skirt (#42159-359, color Ashes): Duralee, 800/275-3872, duralee.com. Appliances: GE Monogram, 800/626-2000, monogram.com. Rug: Nashville Rug Gallery, 615/484-1719, nashvilleruggallery.com. Light fixture (“Ardmore Lantern” #9183): Currey & Co., 877/768-6428, curreycodealers.com. 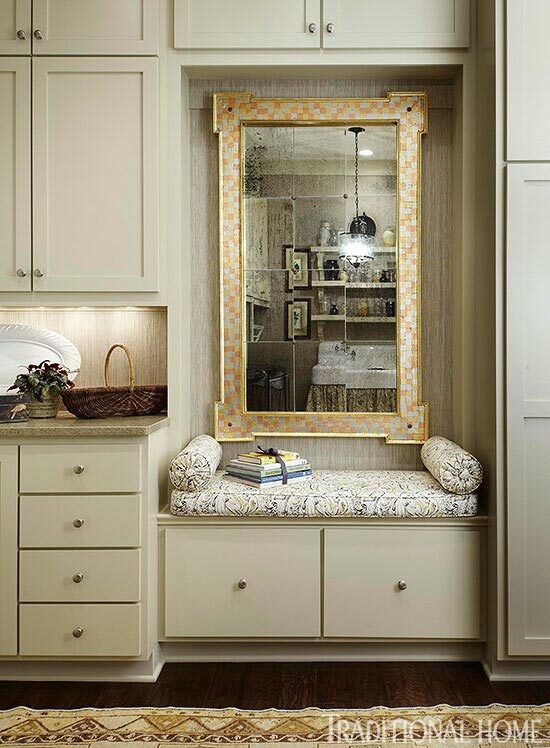 Markanich maximized space in the small room, extending cabinets from floor to ceiling for storage and adding a refrigerator, a built-in desk (where she set up a sewing machine for quick repairs), and a drying rack. Cabinetry: Mid-South Custom Cabinets, 615/287-0380, msccabinets.com. Bench fabric (#42159-359, color Ashes): Duralee, 800/275-3872, duralee.com. Rug: Nashville Rug Gallery, 615/484-1719, nashvilleruggallery. Mirror (custom, McBurney Studio): Timeless Interiors, 615/406-1986, timelessinteriorsdesign.com. The architect put the living room in the center of the house, with French doors along one wall to an outdoor living area. To allow for traffic along that “hallway” side of the room, designers Mark Simmons and Deb Tallent (both class of 1984) created an inviting sitting area around a fireplace. The palette was drawn from Mrs. O’More’s favorite colors and a Turkish-inspired spice-and-teal fabric the designers chose to accent a high-back wing chair. 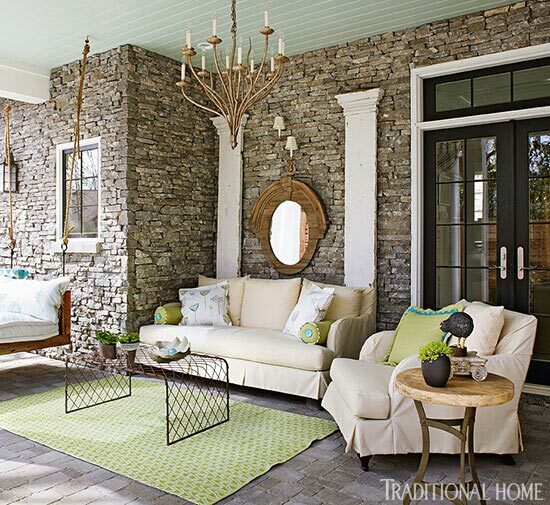 Interior design: Mark Simmons and Deb Tallent, Mark Simmons Interiors, 2021 Woodmont Blvd., Nashville, TN 37215; 615/269-6360, marksimmonsinteriors.com. Wall paint (“Sandy Brown” #1046); trim paint (“White Dove” #OC-17); ceiling paint (“Palace White” #956): Benjamin Moore & Co., 888/236-6667, benjaminmoore.com. Chandelier (“Classic Ring Chandelier”/Hand-Rubbed Brass” #SL5812): Circa Lighting, 877/762-2323. circalighting.com. Chaise (“Jackson Chaise” #C468-58, Transitions Collection): The Charles Stewart Co., 828/322-9464, charlesstewartcompany.com. Chaise fabric (“Sheridan Weave”/Toast #64653); chaise pillow (“Vanessa Embroidery”/Chamois Multi #52090); ottoman fabric (“Preston Linen Chevron”/Teal #3359034); drapery (“Sagaponic Linen Stripe”/Driftwood #54152): Schumacher, 800/523-1200, fschumacher.com. Wing-chair fabric, front (“Temara Embroidered Print”/Spice #175181); wing-chair fabric, back (“Hemp Texture”/Pecan #3260071): Schumacher, 800/523-1200, fschumacher.com. Console base (custom, “Dante”); firescreen (custom, “Bayard” #639A); candlesticks (“Isadora” #280B); accent table (“Fela” #469): Ironware International, 800/850-0460, ironwareinternational.com. Gold pottery lamps on console (“Carved Honey Lamp” by Charlie West Lamps): through Lumen, 615/356-9596, lumenlamps.com. Landscape painting, left of mirror (Winter Landscape, by Emile Gruppe); drawing above painting (Untitled Figure/Gesture Drawings, by Anthony Thieme): Haynes Galleries, 615/312-7000, haynesgalleries.com. Pastel to right of mirror (Orange Boat, by Andrew Portwood): Bennett Galleries, 615/297-3201, benettgalleriesnashville.com. Area rug (Oushak): Jeff’s Fine Rugs & Tapestries, 615/352-5663. The hues are repeated in the sofa, club chair, an antique-looking Oushak rug, and artwork, including portraits of Simmons’s own children. “We wanted the room to be comfortable and inviting as well as have an interesting mix of textures, styles of art, furnishings, and materials,” Simmons says. Sofa fabric (“Marcel Chenille”/Brick #50872); drapery (“Sagaponic Linen Stripe”/Driftwood #54152); pair of pillows on sofa (“Madagascar Ikat Stripe”/Cinnabar #65721): Schumacher, 800/523-1200, fschumacher.com. Center pillow (antique Aubusson rug fragment); sofa end table, left of sofa (“Hourglass Table”/Gold, by Bunny Williams Home); table lamp, left of sofa (“Chicken Feather Lamp”/Brown, by Bunny Williams Home); sofa end table, right of sofa (antique, English oak); coffee table (vintage); small chair, left of sofa (English Orkney chair, antique): Mark Simmons Interiors, 615/269-6360, marksimmonsinteriors.com. Table lamp, right of sofa: Lumen, 615/356-9596, lumenlamps.com. Tufted chair (“Cambridge” #7724-C33): Thibaut, 800/223-0704, thibautdesign.com. Chair fabric (“Belvedere Weave”/Russet #54032); pillow on chair (“Chatelaine Paisley”/Tuscan #50773): Schumacher, 800/523-1200, fschumacher.com. Painting over sofa (Beach Horse, by Leslie Barron): Bennett Galleries, 615/297-3201, benettgalleriesnashville.com. 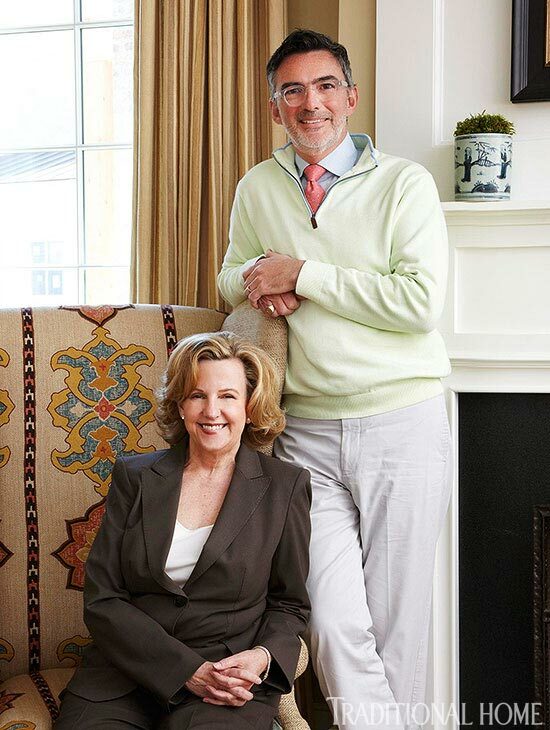 Living room designers Mark Simmons and Deb Tallent. French doors in the living room and master bedroom connect to a covered porch and terrace grounded with cobblestone-like pavers. “Our concept was to create outdoor living spaces, so we started with function,” says Linda Tallent Brown (class of 1983), who furnished the patio area with Louise Kitchell (class of 1978). “We divided it into three areas—dining and seating, which are closest to the living and breakfast rooms, and simply relaxing in the swing, which is closest to the master bedroom,” Brown adds. The swing bed was a must-have, the designers enthuse. Handmade by a local carpenter, the swing was built with reclaimed wood from an 1800s barn. The mattress is covered with indoor-outdoor fabric edged in super-sized piping, giving it an old-fashioned look. See more of the porch on the following slide. Interior design: Louise Kitchell and Linda Tallent Brown, Kitchell & Brown Interiors, 6518 Hwy 100, Nashville, TN 37205; 615/352-4466. Wall lantern (14th Colony Collection): Graham’s Lighting, 615/771-3400, grahamslighting.com. Swing (custom, reclaimed wood): Elemental Restoration & Design, 931/260-6053, elementalrestorations.com. Sofa pillow, left (“Culpepper”/Aqua, Green #J651F-03, by Jane Churchill); sofa pillow, right (“Lynbrook”/Aqua #J654F-03, by Jane Churchill): Cowtan & Tout, 212/647-6900, cowtan.com. Blue pillow (“Zig Zag Weave”/Laguna #65330, by Trina Turk): Schumacher, 800/523-1200, fschumacher.com. Other comfortable seating options are offered in the upholstered sofa and club chairs covered with indoor-outdoor fabrics and cushions. 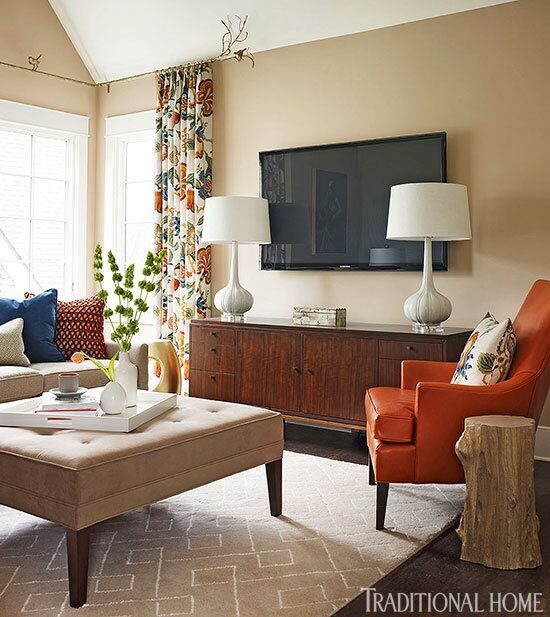 A durable plastic area rug and wire coffee table complete the living-room feel, and the blue-painted ceiling and pillows made with botanically-inspired embroidered fabrics add fresh color accents. A branch-style chandelier and sconces illuminate the spaces and make for magical evenings. 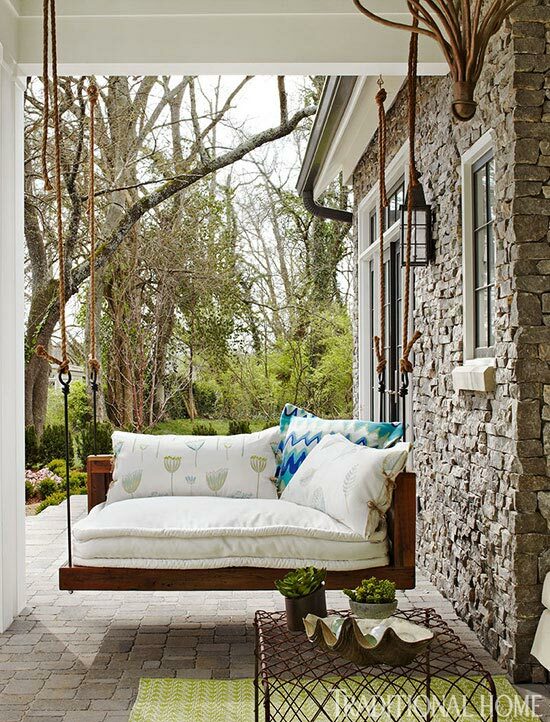 Sofa and chair (Wm Outdoor Upholstery, Colin Collection); fabric (by Sunbrella): Lane Venture, laneventure.com. Patterned pillows on sofa (“Culpepper”/Aqua, Green #J651F-03, by Jane Churchill): Cowtan & Tout, 212/647-6900, cowtan.com. Lime pillows: Kitchell Brown Inteirors, 615/352-4466. Iron coffee table: one of a kind. Wood side table: Graham’s Lighting, 615/771-3400, grahamslighting.com. Chandelier (“Ondine”/Antique Silver #8030-12); wall sconces (“Isadora”/Antique Silver #1008-2): Ironware International, 800/850-0460, ironwareinternational.com. Antique wood columns: Garden Park Antiques, 615/350-6655. 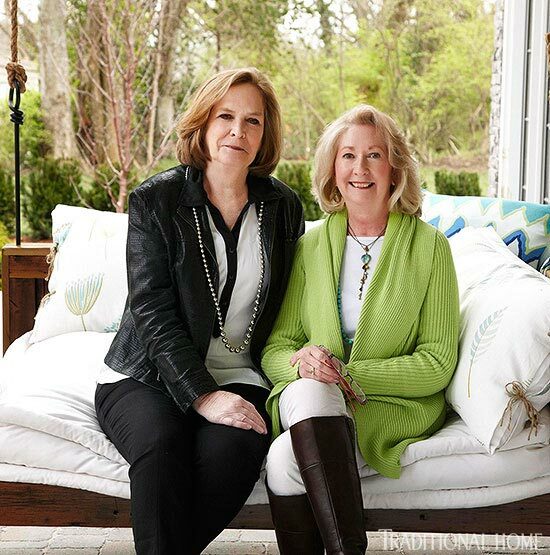 Porch designers Louise Kitchell and Linda Tallent Brown. Dialing down the volume of the day was the aim for Kathleen Evers (class of 1985) when she designed the master suite, which includes an elegant iron four-poster from Ironware International that faces French doors to the terrace. It also has a sitting area with two armchairs, built-in coffee/wet bar, and a mirror-lined bathroom and dressing room. “I wanted restful colors to emphasize that this is a place to relax,” she says. 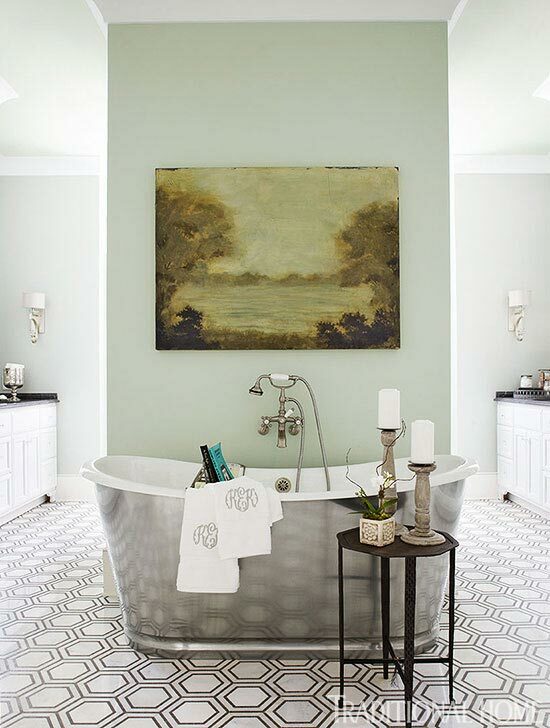 “Soothing aqua and cream, together with warm charcoal accents, appeal to both the masculine and feminine,” she adds. Evers dressed the bed with a pretty pleated silk skirt and sumptuous linens. Rock crystal bedside lamps and a crystal chandelier boost the glam factor. Tailored draperies, made with Vervain’s Palais Royale fabric, hang from platinum-finish curtain rods with crystal finials. See the rest of the master suite on the following slides. Interior design: Kathleen Evers, K. Evers Interiors, 2807-C Bransford Ave., Nashville, TN 37204; 615/973-3899, kathleenevers.com. Wall paint (“Filmy Green” #SW-6190); ceiling paint (“Opaline” #SW-6189): Sherwin-Williams, 800/474-3794, sherwin-williams.com. Trim paint (“White Dove” #OC-17): Benjamin Moore & Co., 888/236-6667, benjaminmoore.com. Bed (“Bernadette” #AQ-P): Ironware International, 800/850-0460, ironwareinternational.com. Duvet and shams (Infinity Collection, by Ann Gish); bedskirt (Monaco Collection, by Ann Gish); Euro shams (“Lavello,” by Tourmaline Home); accent pillow (by Red Sheep Textiles): Lulu Franklin, 615/794-3345, lulufranklin.com. Round bedside table (“Arthur Table”): Mitchell Gold+Bob Williams Nashville, 615/460-7665, mgbwhome.com. Rock crystal table lamps: designer’s collection. Oushak rug: Nashville Rug Gallery, 615/484-1719, nashvilleruggallery.com. Painting behind bed (Breath of Storm, by Paula Frizbee); painting to left of bed (The Gloaming, by Dawn Whitelaw): Imagine Gallery, 615/794-7997, imagine-gallery.net. Drapery (“Palais Royal” color 01): Vervain, 800/611-8686, vervain.com. Drapery hardware: The Finial Co., 214/678-0805, finialco.com. Chandelier (“Buckingham” by Cyan Designs): Graham’s Lighting, 615/771-3400, grahamslighting.com. Area rug (“Trafalgar”/Waterloo #9223, color 420): Masland Carpets, 800/633-0468, maslandcarpets.com. Through Carpet Den Interiors, 615/656-7662. A large oil painting by artist Ryan S. Brown titled Daydreams reinforces that laid-back feel. 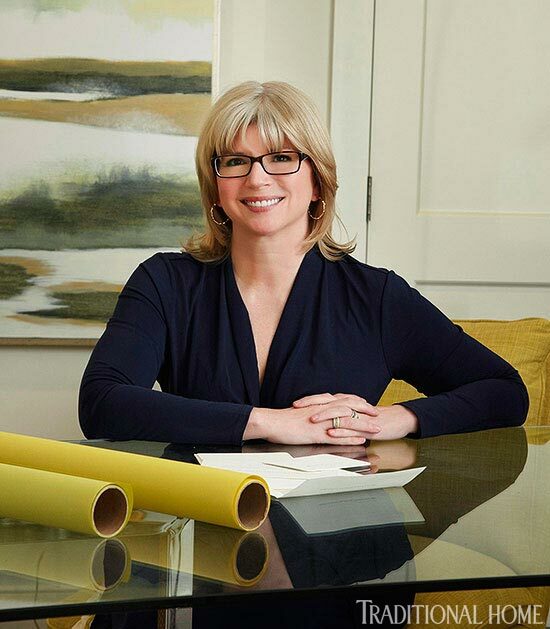 Project organizer Haynes encouraged showhouse designers to display original art in their spaces. “I had seen gallery art used at a showhouse in New York and thought it would be a wonderful opportunity for our Nashville gallery and would add to the impact of the rooms,” she explains. Painting (Daydreams, by Ryan Brown): Haynes Galleries, 615/430-8147, haynesgalleries.com. Club chairs and ottoman (“Marlena”); chair and ottoman fabric (“Plymouth”/Grey): Mitchell Gold+Bob Williams Nashville, 615/460-7665, mgbwhome.com. Floor lamp (“Anson #373); accent drum table (“Ryman Table” #453): Ironware International, 800/850-0460, ironwareinternational.com. Aqua pillows (“Tourmaline”): Lulu Franklin, 615/794-3345, lulufranklin.com. Area rug (“Trafalgar”/Waterloo): Masland Carpets, 800/633-0468, maslandcarpets.com. Through Carpet Den Interiors, 615/656-7662. Wall paint (“Contented” #SW-6191); ceiling paint (“Opaline” #SW-6189): Sherwin-Williams, 800/474-3794, sherwin-williams.com. 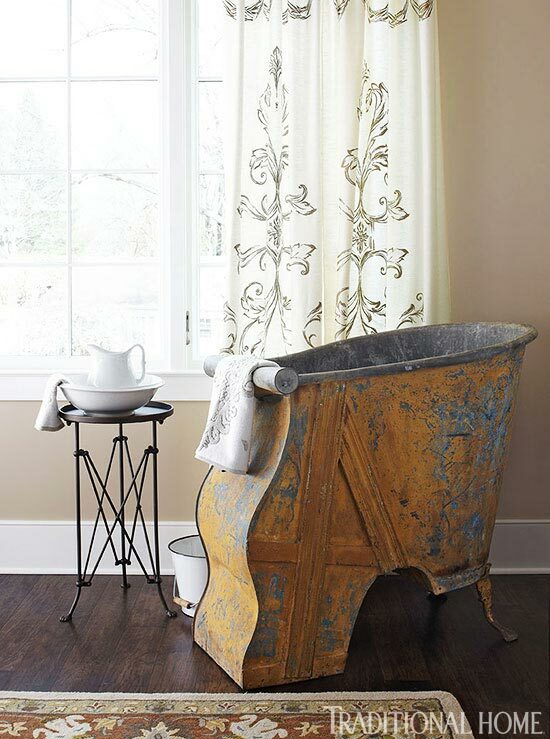 Tub (“67-inch Dorset Cast Iron Bateau Tub with Stainless Steel Skirt” #357140, Whittington Collection): Signature Hardware, 866/855-2284, signaturehardware.com. Bath fixtures (“Bancroft”/Brushed Nickel): Kohler, 800/456-4537, kohler.com. Art behind tub (by Charlotte Terrell): Bennett Galleries Nashville, 615/297-3201, bennettgalleriesnashville.com. Table beside tub (“Michel” #954S): Ironware International, 800/850-0460, ironwareinternational.com. Tile floor (“Hex Appeal”) Mission Stone & Tile, 615/244-6448, missionstonetile.com. Towels: Lulu Franklin, 615/794-3345, lulufranklin.com. The bathroom floor plan divides the room in half, with dual vanities and dressing areas separated by a center walk-in shower that can be entered from either side. At the far end of the room, a built-in chest of drawers and sit-down dressing table are as functional as they are charming. Wall sconce (“Chase 2-Light Wall Sconce” #D1986): Robert Abbey, 828/322-33480, robertabbey.biz. Bench (“Zoe Stool”/Black #813): Merridian Home Furnishings, 615/463-0555. Bench fabric (“Ghent”/Ocean #9122): Pindler & Pindler, 805/531-9090, pindler.com. Vanity cabinet: Mid-South Custom Cabinets, 615/287-0380, msccabinets.com. Faucets (“Bancroft” #K-10577-4P-BN): Kohler, 800/456-4537, kohler.com. Through Ferguson Enterprises, 615/385-3054. Wall sconce by sink (“Rosendal 1-Light Sconce” #9-256-1-307): Savoy House, savoyhouse.com. Through Graham’s Lighting, 615/771-3400. Mirror (“Arabesque Beveled Mirror” #01341): Cyan Design, 888/371-3072, cyandesign.biz. 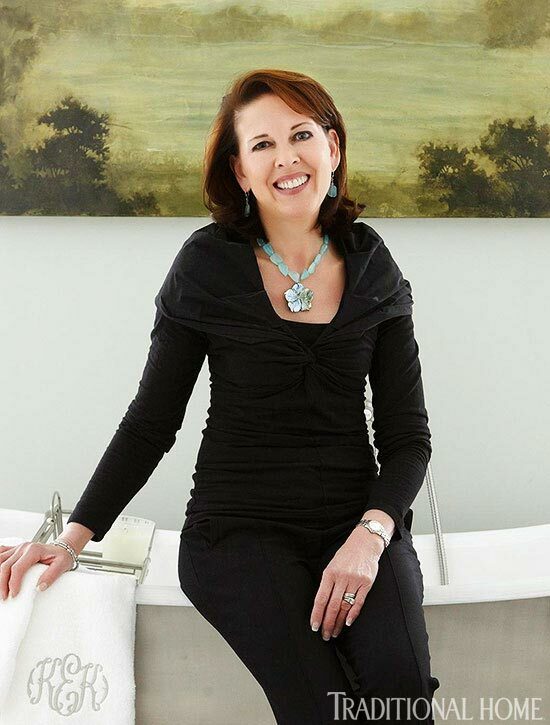 Master suite designer Kathleen Evers. 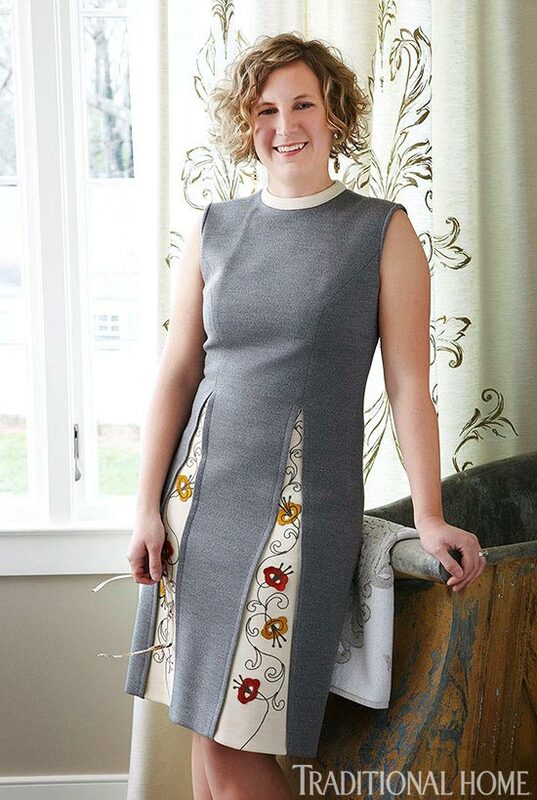 Designer and antiques store owner Scarlett Scales-Tingas (class of 2004) brought her flair for whimsy, history, and repurposing materials to an upstairs guest bedroom. Vintage hand-painted drapery panels she used for the windows and as a shower curtain in the adjoining bath set her color scheme of ivory and muted gold. 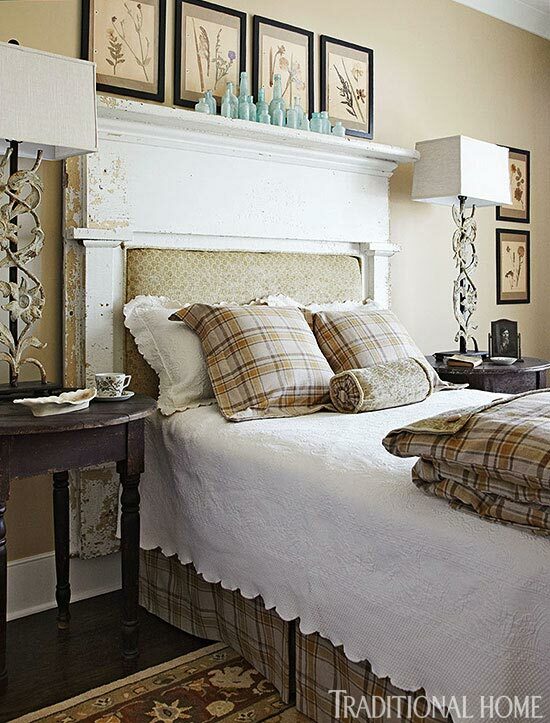 Pages from an old scrapbook of pressed flowers were framed and arranged around the headboard, which was fashioned from a salvaged wood mantel. Interior design: Scarlett Scales-Tingas, Scarlett Scales Antiques, 246 Second Ave. S., Franklin, TN 37064; 615/791-4097, scarlettscales.com. Wall paint (“Balanced Beige” #SW-7037): Sherwin-Williams, 800/474-3794, sherwin-williams.com. Ceiling and trim paint (“White Dove” #OC-17): Benjamin Moore & Co.,888/236-6667, benjaminmoore.com. Bed; side tables; table lamps; art; bottles: Scarlett Scales Antiques, 615/791-4097, scarlettscales.com. Headboard fabric; plaid duvet and shams; bed cover; area rug: Scarlett Scales Antiques, 615/791-4097, scarlettscales.com. 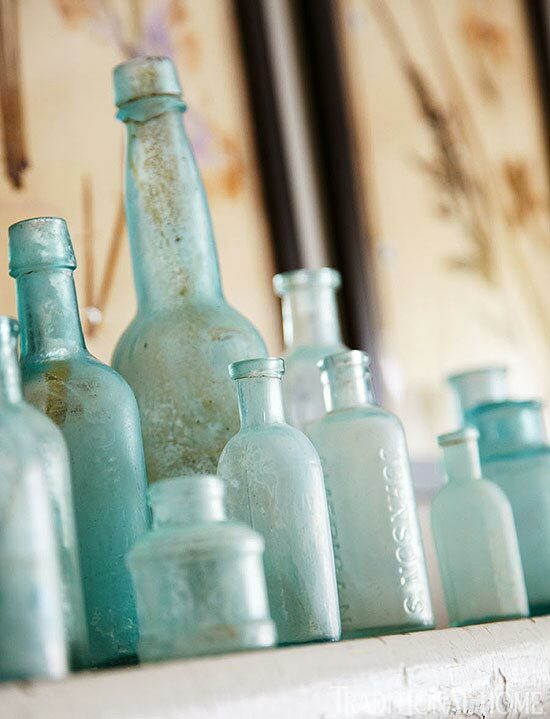 Blue bottles dating from the 1860s and dug from dump sites make a nostalgic arrangement on top of the headboard. “After spending more than 100 years in the earth, the acids in the soil eat away at the glass. That process is what gives them that nice cloudy iridescence,” Scales-Tingas says. Wall paint (“Accessible Beige” #SW-7036): Sherwin-Williams, 800/474-3794, sherwin-williams.com. French Zinc Campaign Tub; side table; drapery (vintage); area rug: Scarlett Scales Antiques, 615/791-4097, scarlettscales.com. Guest bedroom and bath designer Scarlett Scales-Tingas. 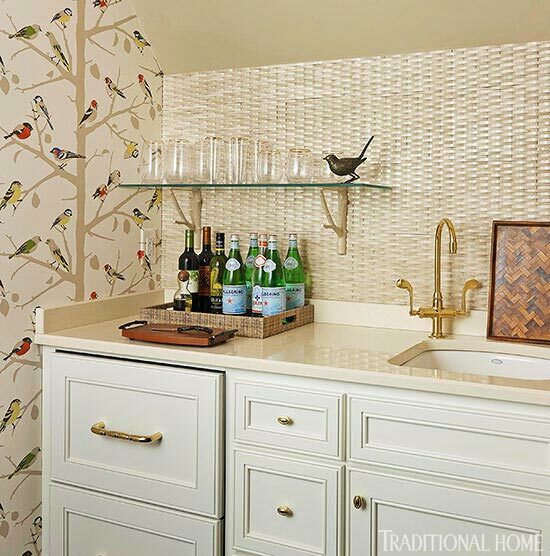 Kim Zimmer (class of 2004) went for bold colors and large-scale patterns to create a bright and welcoming upstairs family room with adjoining aviary-inspired wet bar. The sofa, two teal velvet-covered chairs, an oversized ottoman, and a high-back leather chair allow for ample and comfortable seating while watching TV. See more of the family room on the following slides. 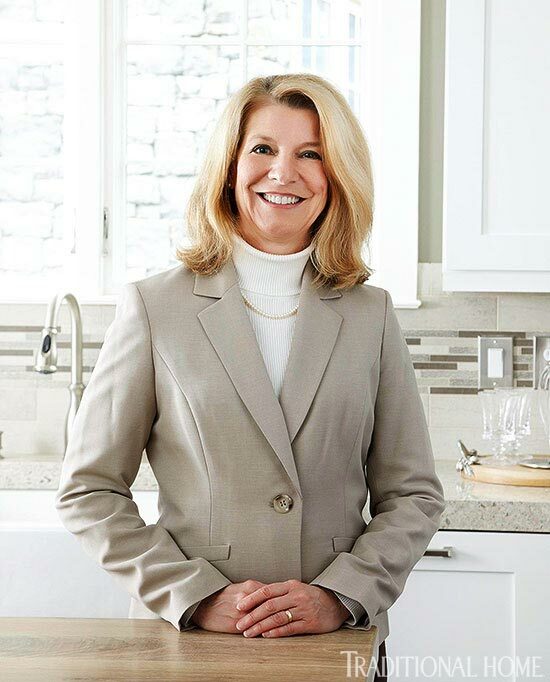 Interior design: Kim Zimmer, Kim Zimmer Interior Design, 324 Liberty Pike, Suite 229, Franklin, TN 37064; 615/791-4409. Wall and ceiling paint (“Bar Harbor Beige” #1032); trim paint (“White Dove” #OC-17): Benjamin Moore &Co., 888/236-6667, benjaminmoore.com. Sofa (Cara Collection); sofa fabric (“Wilton”/Sand); ottoman (“Terence Square Ottoman”); ottoman fabric (“Plymouth”/Mushroom #102823); rug (“Moroccan”); white tray; blue velvet pillow; orange swirl pillow: Mitchell Gold + Bob Williams, 615/460-7665, mgbwhome.com. Drapery (“Hothouse Flowers”/Spark #17403): Schumacher, 800/523-1200, fschumacher.com. 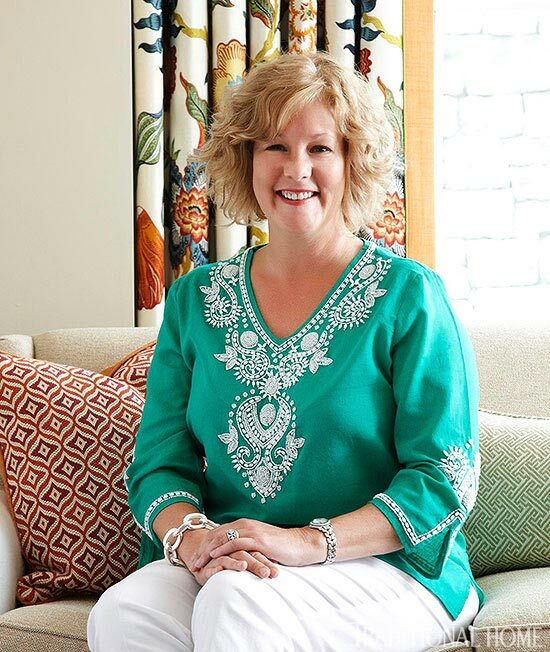 Drapery rod (custom): Kim Zimmer Interior Design, 615/791-4409. Leather chair (“Dana”); chair leather (“Rojo”/Orange #2315); ivory lamps (“Marnie Table Lamp”/Lily White); stump side table (“Demitree Antique Gold Pull-Up Table”); chest (“Vandyke Drawer/Door Chest); gold leaf table to left of chest (“Olive Gold Leaf Pull-Up Table”): Mitchell Gold + Bob Williams, 615/460-7665, mgbwhome.com. “I started with the wall covering in the bar area, called ‘A-Twitter,’ and then repeated the bird-and-branch motif throughout the space,” she says, pointing to gold-toned birds perched on the curtain rods. Wallpaper (“ A Twitter”): Schumacher, 800/523-1200, fschumacher.com. Wall paint (“Bar Harbor Beige” #1032); trim paint (“White Dove” #OC-17); ceiling paint around bar (“Spiced Pumpkin” #034): Benjamin Moore &Co., 888/236-6667, benjaminmoore.com. Cabinets: Mid-South Custom Cabinets, 615/287-0380, msccabinets.com. Countertop (“Cuddington,” Desert Collection): Cambria, cambriausa.com. Wall shelf brackets: West Elm, 888/922-4119, westelm.com. Backsplash (“3D Weave Crema Marfil”): by Soho Studio Corp., 718/677-8453. Through Watson Floor Gallery, 615/371-1111, watsonfloorgallery.com. Sink (“Napa”/White, undermount); faucet (“Essex”/Polished Brass): Kohler, 800/456-4537, kohler.com. Painting (Acadia Again, by Burton P. Silverman): Haynes Galleries, 615/430-8147, haynesgalleries.com. Orange lamp: Lumen Lamps, 615/356-9596, lumenlamps.com. 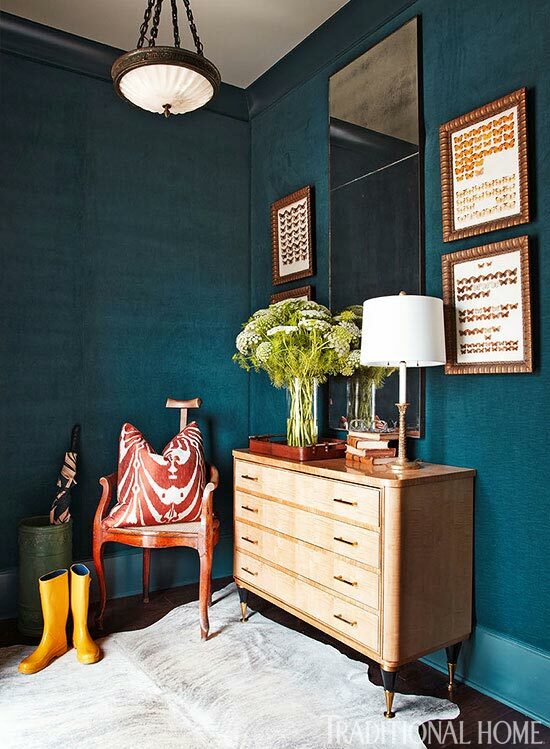 Club chairs (“Blakely Chair”); chair fabric (“Gilmore”/Teal #103069): Mitchell Gold + Bob Williams, 615/460-7665, mgbwhome.com. Family room designer Kim Zimmer. Dormers and sloped rooflines on the shingle-style cottage’s exterior create charming nooks and niches inside, such as this cozy guest room window alcove, designed by showhouse coordinator JoAnne Haynes. “I envisioned the room as a fresh, bright space where a visiting adult might come with a child,” she says. “The daybed could accommodate a youngster or offer a place to relax in private.” this sitting or sleeping spot in a guest room above the garage. Schumacher’s “Chinois Palais” in Lettuce, which designer JoAnne Haynes used to cover the center pillow on the daybed, inspired the color palette. See more of the guest bedroom on the following slides. 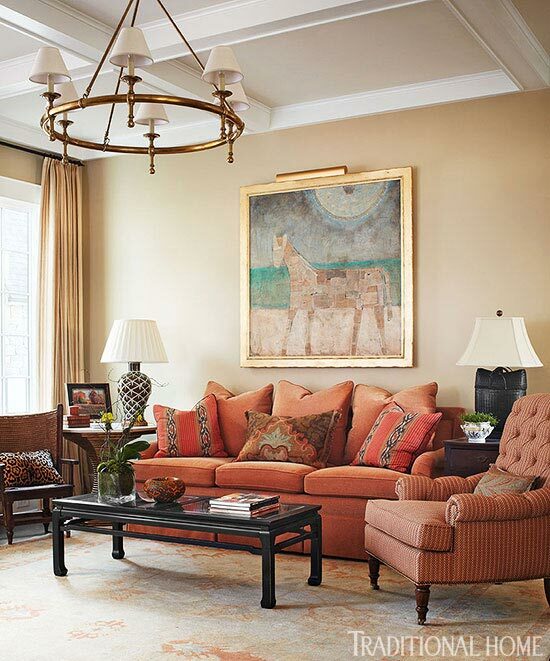 Interior design: Jo Anne Haynes, J. Haynes Interiors, 135 Steeplechase Lane, Nashville, TN 37221; 615/429-0955, jhaynesinteriors.com. Wall paint (“Edgecomb Gray” #HC-173); ceiling and trim paint (“White Dove” #OC-17); accent mold (“Chelsea Gray” #HC-168): Benjamin Moore & Co., 888/236-6667, benjaminmoore.com. Check pillows: Lulu Franklin, 615/794-3345, lulufranklin.com. Green pillow (“Chinois Palais”/Lettuce #175040, by Mary McDonald): Schumacher, 800/523-1200, fschumacher.com. Wall sconces (by Visual Comfort): Circa Lighting, 877/762-2323, circalighting.com. Plates (antique canton); black chair; gray pillows: designer’s collection. Table (“Twig Table”/Brass and White Marble #8976): Global Views, 888/956-0030, globalviews.com. Painting (Storm Approaching, by Heidi Palmer): Haynes Galleries, 615/430-8147, haynesgalleries.com. Rug (“Super Chic”/Roller Disco #Z6442-00110): Shaw Floors, 800/441-7429, shawfloors.com. Through Myers Carpet, 615/777-3344, myersflooringnashville.com. Color inspiration comes straight from the Tennessee landscape: green grass, blue skies, and white clouds. “I brought in the bright greens from the outside views and accented that with sky blue in the antique Canton ware [blue-and-white dishes],” she says. The slanted ceilings, which are part of the house’s charm, were a bit of a challenge because they resulted in some 7-foot-tall walls. “To camouflage that and add a casual elegance, I applied painted wood to the ceiling and installed a gray accent molding to draw the eye up,” she says. Bamboo-style headboard (#BED-7441/60): Louis J. Solomon, 212/545-9200, louisjsolomon.com. Bedding: Matouk., matouk.com. Through Lulu Franklin, 615/794-3345, lulufranklin.com. Green pillow (“Don’t Fret”/Lettuce #66180): Schumacher, 800/523-1200, fschumacher.com. Chest (antique); box; lamp: J. Haynes Interiors, 615/429-0955, jhaynesinteriors.com. Painting (New England House, by Gary R. Haynes): Haynes Galleries, 615/430-8147, haynesgalleries.com. 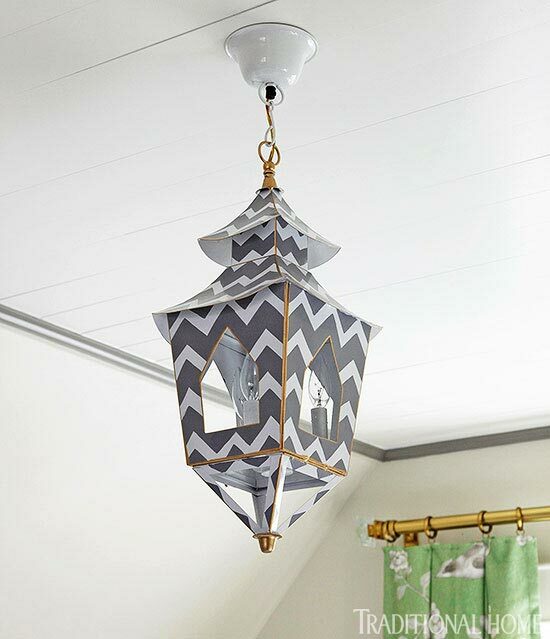 Tole lantern (“Grey Bargello Lantern,” hand painted): Dana Gibson, 804/321-0156, danagibson.com. Drapery (“Chinois Palais”/Lettuce #175040, by Mary McDonald): Schumacher, 800/523-1200, fschumacher.com. Brass drapery rod and finial: Restoration Hardware, 800/910-9836, restorationhardware.com. 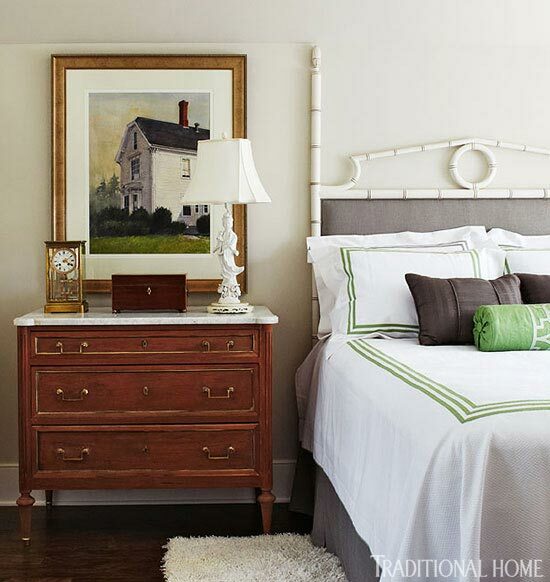 Guest bedroom designer JoAnne Haynes. An upstairs storage studio was carved out of space in the attic above the master suite thanks to Kathy Sandler (class of 2004). Open shelves along the walls and a glass-topped table set the stage for multiple activities: packing, off-season clothing storage, hobbies, and gift wrapping. “The floor area is large at 11 by 14, but the knee walls and steeply pitched ceiling called for low-profile furnishings,” Sandler says. She went with a petite upholstered chair that wouldn’t crowd the space, as well as a glass-and-chrome table and a large floor-length mirror that reflect light. 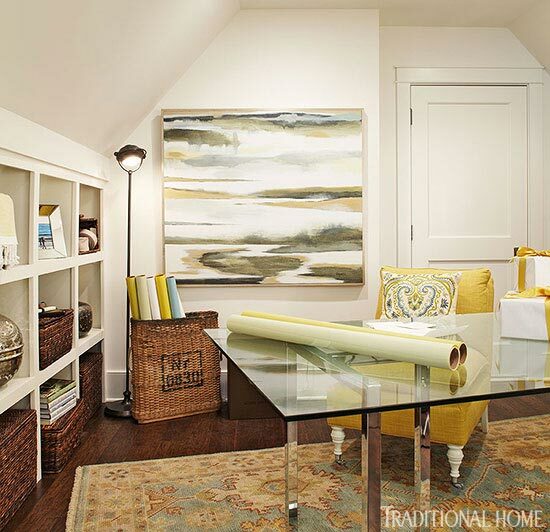 Citron-colored fabric and artwork add rays of sunshine to the windowless space. 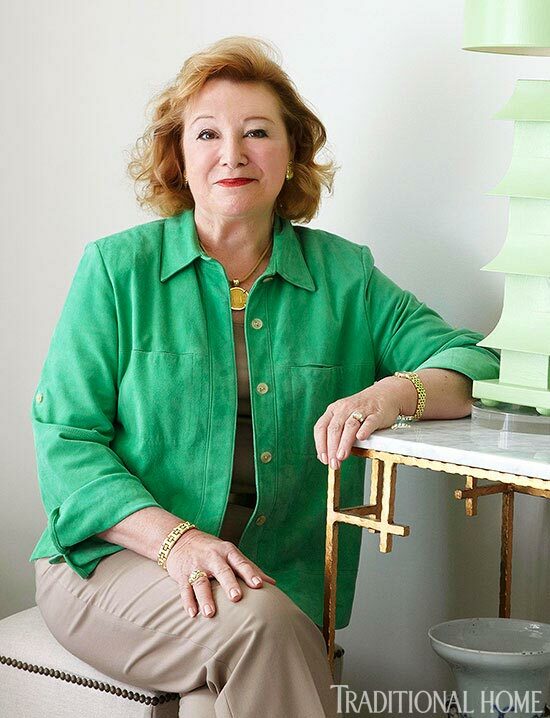 Interior design: Kathy Sandler, SD Studio, 615/440-8915, livethefinelife.com. 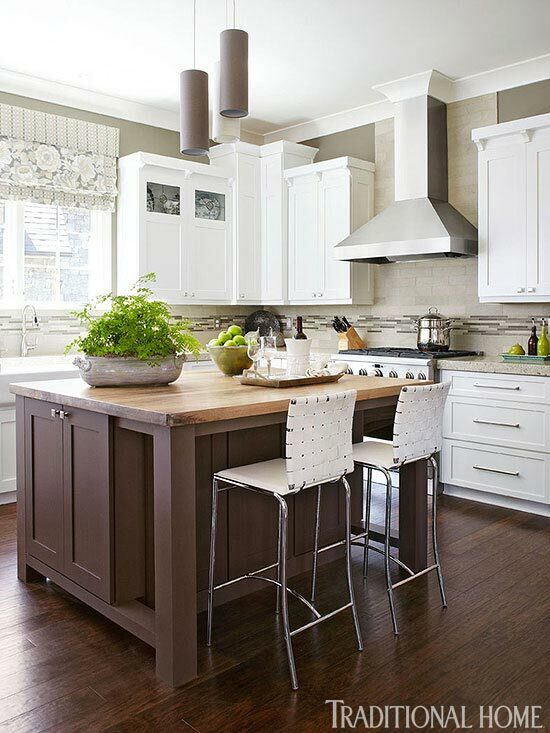 Walls, ceiling and trim paint (“White Dove” #OC-17): Benjamin Moore &Co., 888/236-6667, benjaminmoore.com. Table (“Silverado Rectangular Dining Table” #261408): CB2, 800/606-6252, cb2.com. Chair (“Zondra Chair”); chair fabric (“Meridian”/Citron #103164): Mitchell Gold + Bob Williams, 615/460-7665, mgbwhome.com. Rug (custom, Oushak): Nashville Rug Gallery, 615/484-1719, nashvilleruggallery.com. Floor lamp: Lumen Lamps, 615/356-9596, lumenlamps.com. Painting (Verdant Emotions, by Lyndi Lende): Mitchell Gold + Bob Williams, 615/460-7665, mgbwhome.com. Storage and file baskets: Pottery Barn, 800/922-5507, potterybarn.com. Paper goods: Rock Paper Scissors, 615/791-0150, rockpaperscissors.com. Storage studio designer Kathy Sandler. A few steps down the hall, John Starbuck (class of 1983) transformed a boxy alcove into a cozy reading nook, using warm colors and antiques, such as a Tennessee cherry plantation desk. To soften harsh sunlight and add a dramatic jewel-like backdrop, the designer arranged stained-glass panels in front of otherwise unremarkable windows. In tribute to Mrs. O’More, Starbuck painted the ceiling a salmon-coral hue he recalled her using for her dining room ceiling. “I loved it because it gave almost a sunrise lifting effect,” he says. “I often use accent colors on ceilings to define spaces.” Starbuck hand-painted a simple garland around the chandelier to draw the eye upward. See the powder room by John Starbuck on the following slide. Interior design: John D. Starbuck Jr., Starbuck Designers Inc., 5141 Boxcroft Pl., Nashville, TN 37205; 615/356-4407, starbuckdesigners.com. Wall paint (“Antique Parchment” #959); trim paint (“White Dove” #OC-17); ceiling paint (custom): Benjamin Moore & Co., 888/236-6667, benjaminmoore.com. Chandelier (“6-Light Pagoda” #CIE-0335/6-42, by Colony Imports): Graham’s Lighting, 615/771-3400, grahamslighting.com. Drapery (“Wool Sateen”/Cashmere): Beacon Hill, 800/333-3777, beaconhilldesigncom. Area rug (antique Heriz): Nashville Rug Gallery, 615/484-1719, nashvilleruggallery.com. Wing-chair fabric (“Meridian Grospoint”/Ruby #BR-89264-177): Brunschwig & Fils, 800/538-1889, brunschwig.com. Pillow (“Orvis”/Pampas): Robert Allen, 800/333-3777, robertallendesign.com. Contemporary cherry stand; stained glass, plantation armchair: Starbuck Designers Inc., 615/356-4407, starbuckdesigners.com. Triple arm floor lamp: Lumen Lamps, 615/356-9596, lumenlamps.com. Cast bronze torso (Female Torso, by Rick Casali): Haynes Galleries, 615/430-8147, haynesgalleries.com. Starbuck also painted whimsical motifs in a nearby powder room. 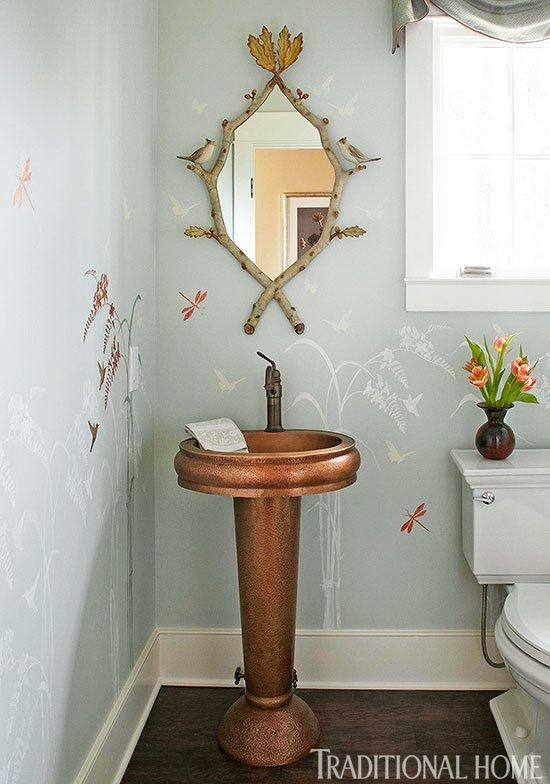 A copper pedestal sink commands attention. Wall paint (“Gray Cashmere” #2138-60); ceiling and trim paint (“White Dove” #OC-17): Benjamin Moore & Co., 888/236-6667, benjaminmoore.com. Wall mural (by John Starbuck): Starbuck Designers Inc., 615/356-4407, starbuckdesigners.com. Sink (“Oval Copper Pedestal”/Hammered Exterior, Smooth Basin, Whittington Collection); faucet (“Cornell Single Hole Faucet with Pop Up Drain”): Signature Hardware, 866/855-2284, signaturehardware.com. Mirror: J. Haynes Interiors, 615/429-0955. Scarf valance (“Faunsdale”/Seaglass, and “Tramore II”/Copper): Robert Allen, 800/333-3777, robertallendesign.com. 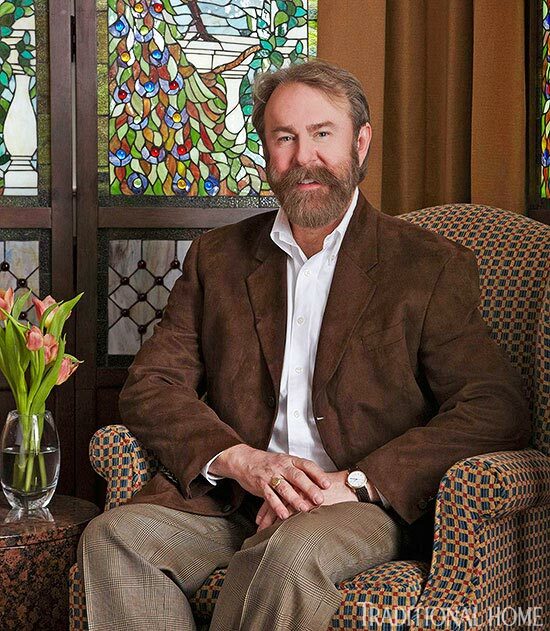 Study and powder room designer John Starbuck. Jennifer Jones (class of 1982) warmed a first-level back stair hall by upholstering a focal-point wall (it’s visible the length of the house) with burlap outlined with upholstery tape and nailheads. 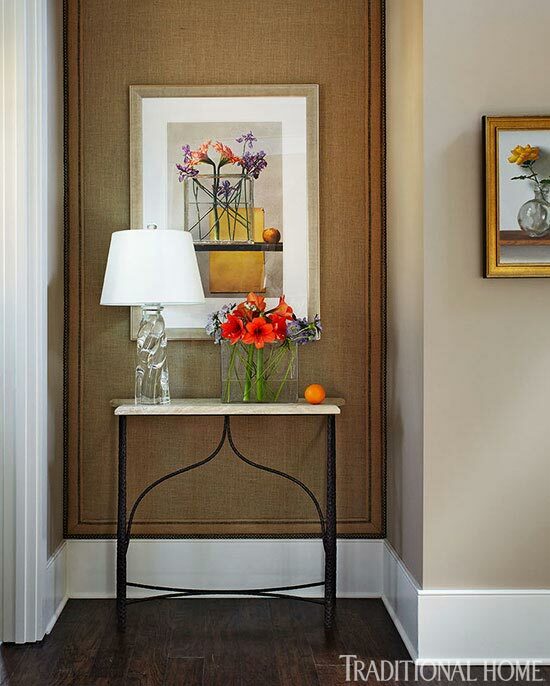 The wall treatment provides a tailored backdrop for an elegant iron-and-limestone table, a crystal lamp, and a painting of tiger lilies (mimicked in real life with flowers and an orange on the table). 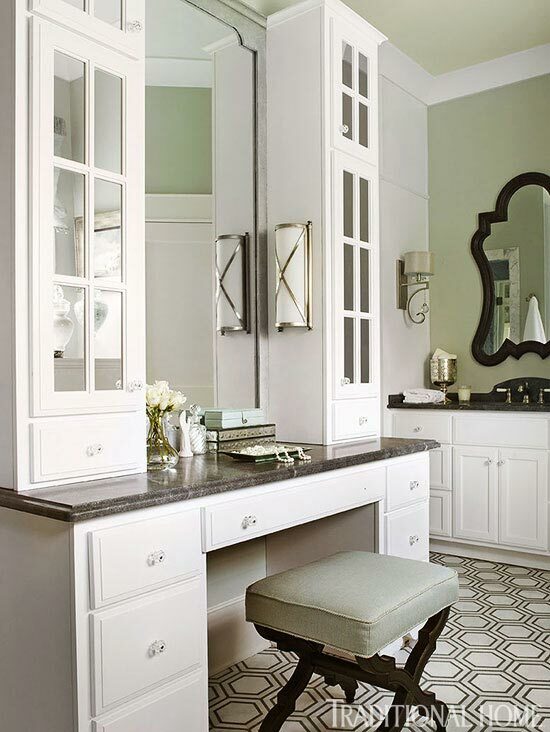 See the powder room by Jennifer Jones on the following slide. Interior design: Jennifer Jones, Jennifer Jones Designs Inc., 6594 Hwy. 100, Nashville, TN 37205; 615/354-8907. Wall paint (“Valley Forge Tan” #AC-35); ceiling and trim paint (“White Dove” #OC-17): Benjamin Moore & Co., 888/236-6667, benjaminmoore.com. Flooring (“Pebble Hill II 5-inch Epic Engineered Hickory”/Weathered Saddle): Shaw Floors, 800/441-7429, shawfloors.com. Console table (“Lucas” #472): Ironware International, 800/850-0460, ironwareinternational.com. Table lamp (pewter and blown glass): Lumen Lamps, 615/356-9596, lumenlamps.com. Watercolor above console (Yellow Paper Composition, by Karen Horn); painting on wall at right (Gold and Green, by Krista Schoening): Haynes Galleries, 615/430-8147, haynesgalleries.com. 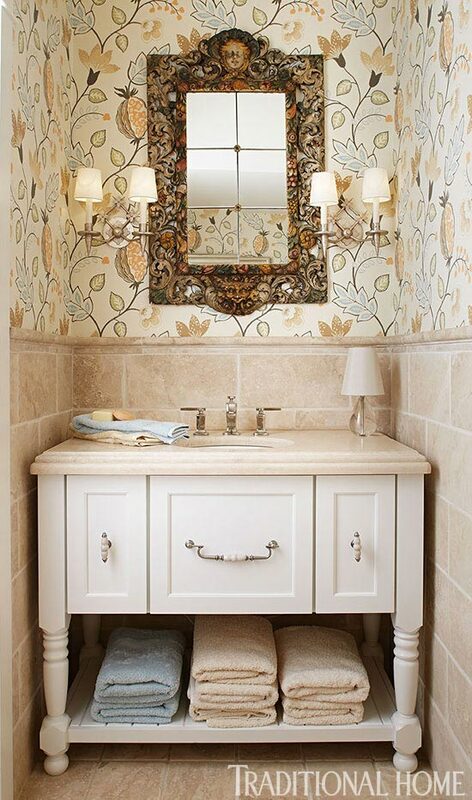 In the nearby hall powder room, Jones installed a floral wall covering above limestone wainscoting. The paper’s pattern peeks through the fretwork of the handmade Italian mirror. When choosing the paper, Jones was mindful of the colors in adjoining rooms. “It needed to complement the surrounding rooms, which included the living room, master bedroom, and up the stairs,” she notes. Wallpaper (“Benvarden” #W5600-03): Osborne & Little, 212/751-3333, osborneandlittle.com. Workroom: Jerry Kemp, Kemp Wallcoverings, 615/969-1011. Vanity cabinet (by Holiday Kitchens): Kitchen & Bath Images, 615/377-8771, kitchenbathimages.com. Wall sconces (“Pascale”/Antique Silver #138-2B): Ironware International, 800/850-0460, ironwareinternational.com. Mirror (Italian antique): designer’s collection. One of the successful aspects of the project was how well all the designers worked together to create spaces that flowed beautifully from room to room, says Haynes. “There was no jealousy or competition. Everyone shared ideas and sources,” she adds. That’s probably because each shares a common loyalty to O’More College. Our appreciation to Traditional Home sponsors Belgard Pavers (terrace and front walk pavers) and Shaw Floors (wood flooring throughout). 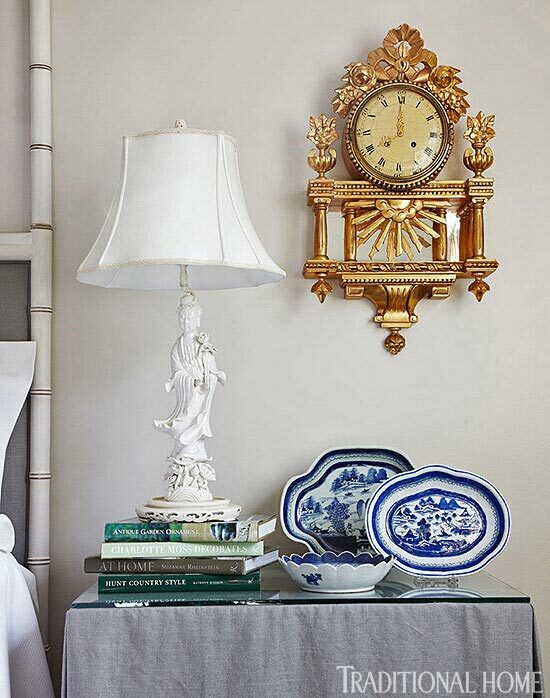 Clock; lamp: J. Haynes Interiors, 615/429-0955, jhaynesinteriors.com. 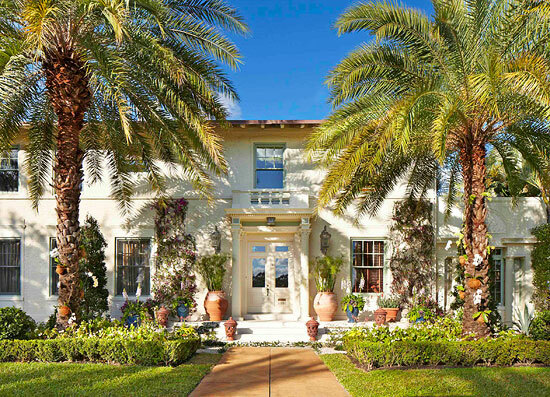 Tour another spectacular home created by 22 renowned designers at the Red Cross Palm Beach Showhouse in West Palm Beach.